Back in October 2017, Microsoft released the Fall Creators Update for Windows 10. For most people, all was well. But for a surprisingly large minority, the Start menu just sort of stopped working. Clicking the Start button did nothing, and neither did right-clicking it. Sometimes, open apps won’t even show up on the taskbar. Apparently, it’s still not working right for some people 5 months later! Well, okay, just because this fix has worked for me doesn’t mean it’s gonna work in your specific case. But I couldn’t find anybody else talking about it. I actually got the idea from one of those Microsoft support site posts – you know, the kind where the MS techie responds as least 72 times with the exact same copy/paste post. 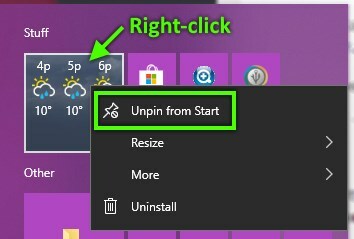 If the Start menu is not showing, reboot. Usually, the Start menu will work for a few minutes before dying again after a reboot – at least in my experience. The idea is that there is some issue with live tiles for various apps. When the tile tries to update – or something – the Start menu goes kaflooey. I just remove all non-essential built-in live tiles from the Start menu, and then I never see the problem again. One exception: the Weather tile seems to work just fine, so I usually leave that one alone. 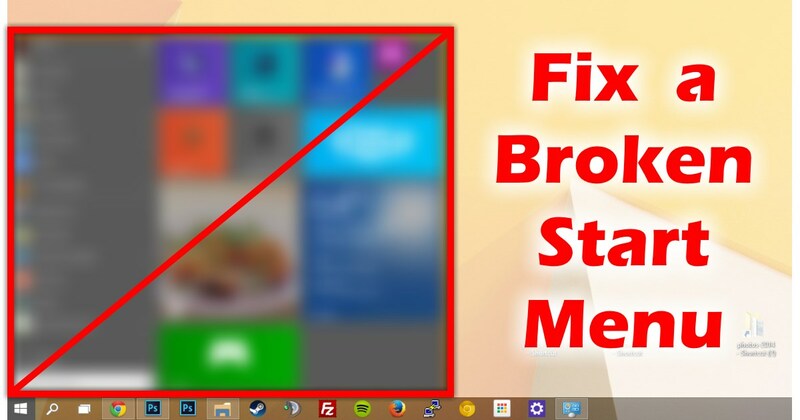 If that doesn’t work, you can find other methods to fix the Start menu here. None of those solutions worked for me on multiple puters that had this problem, but as always, YMMV! If you find another solution, I’m all ears! I had about a day during which my “Internet access” icon was replaced by the “airplane mode” icon. Everything was working OK except that it looked like my Win10 (with all updates) laptop was in airplane mode. Then magically it went back to normal once when I clicked on that icon. I do not think that was the first time I clicked on it. That happens normally when the machine is in airplane mode. Even if you have an ethernet cable connected, you don’t see the normal icon – you see the airplane. Kind of dumb, but there you have it… I guess they assume everyone is using WiFi now. Thanks! It worked for me. I have tried Search and Indexing Troubleshooter and System File Checker using Windows Powershell but found no errors. Lucky for me that I have an user account that I can still see the Start Menu and managed to unpin everything from there. You saved my sanity, Scottie! I spent hours trying suggested fixes and none of them worked. So happy I found you! 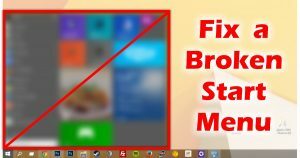 I was searching for the solution to fix the broken start menu in windows 10 when I updated the windows 10 in my laptop and I got the solution form this article where the instructions are properly described.